Let your children enjoy fun in the sun without burning their skin with Equate Kids Continuous Sunscreen Spray. The continuous spray goes on evenly and dries quickly with up to 80 minutes of water-resistance. 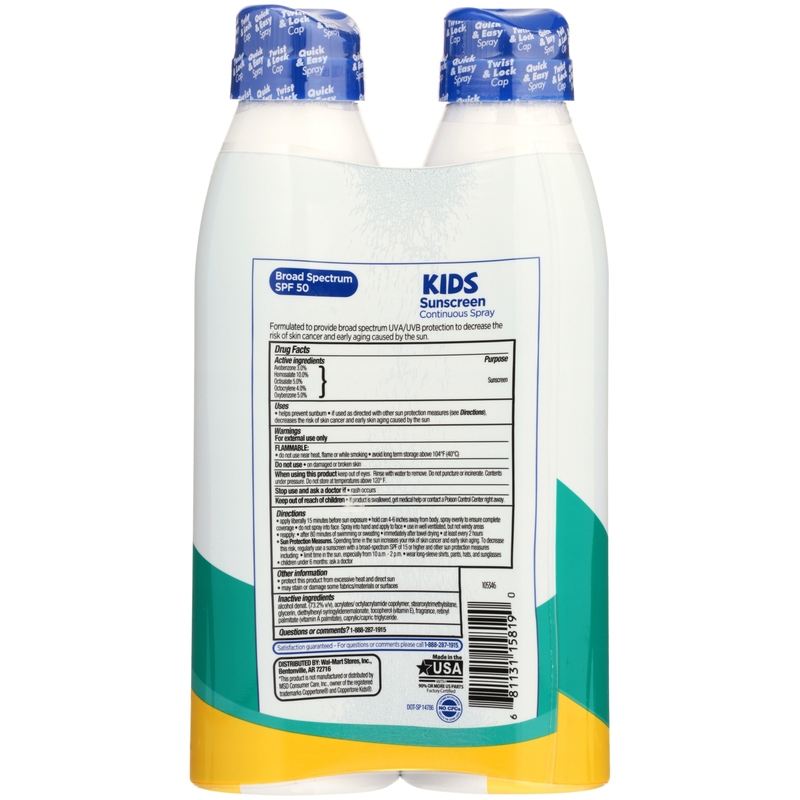 This twin pack features 2 bottles of SPF 50 sunscreen sprays that gives your child's skin the UVA/UVB protection you need to help prevent sunburn and to decrease the risk of skin cancer and early aging caused by the sun. 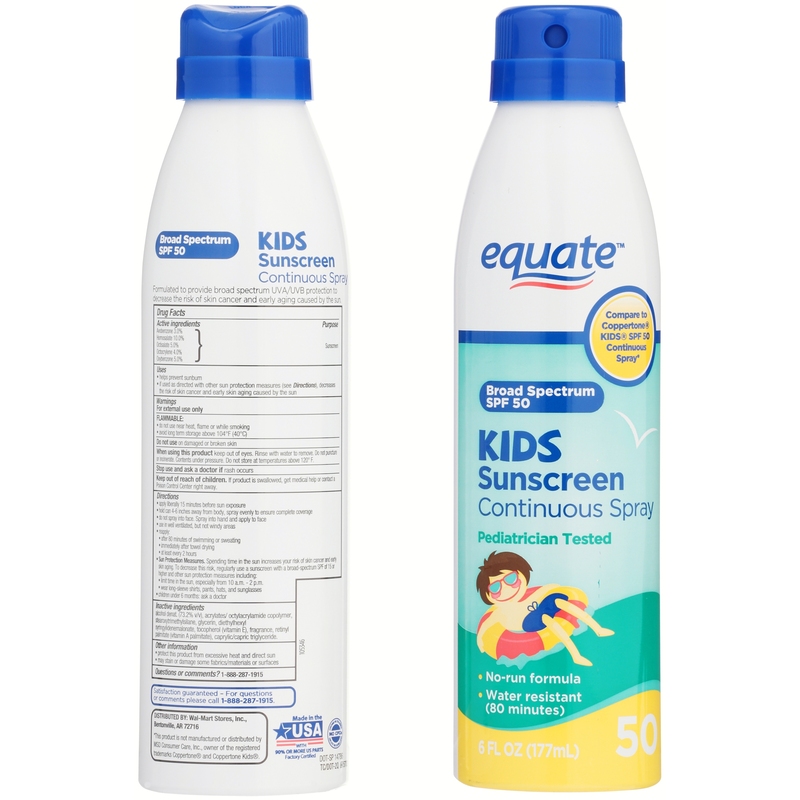 Equate's sunscreen is pediatrician tested and contains a no-run formula. This sunscreen is light and is perfect for using in your backyard, at the pool, at the lake, or during summer sports. For best coverage spray liberally and spread evenly by hand 15 minutes before sun exposure. Reapply as needed like 80 minutes of swimming or sweating, immediately after towel drying, or at least every 2 hours. 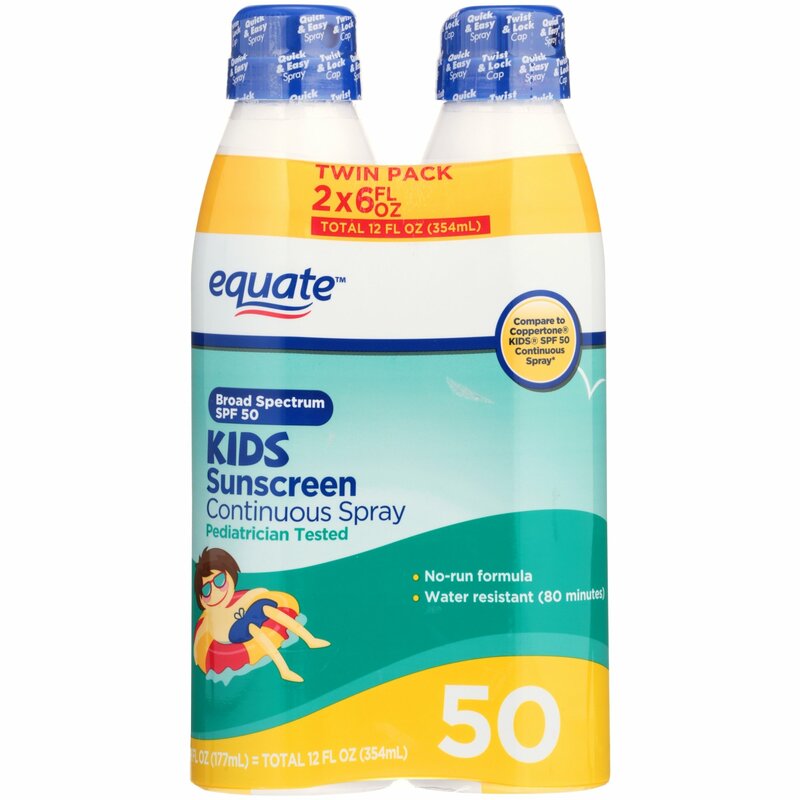 Have fun this summer and take care of you child's skin with Equate Kids Continuous Sunscreen Spray. Stop Use Indications: For external use only. Do not use near heat, flame or while smoking. Avoid long term storage above 104F (40C). Keep out of eyes. Rinse with water to remove. Do not puncture or incinerate. Contents under pressure. Do not store at temperatures above 120F. If rash occurs. Keep out of reach of children. If product is swallowed, get medical help or contact a Poison Control Center right away. Inactive Ingredients: Alcohol denat (73.2% v/V), acrylates/octylacrylamide copolymer, stearoxytrimethylsilane, Glycerin, Diethylhexyl Syringylidenemalonate, tocopherol (Vitamin E) Fragrance, Retinyl Palmitate (Vitamin A Palmitate), Caprylic/Capric Triglyceride. Instructions: Apply liberally 15 minues befor sun exposure. Hold cand 4-6 inches away from body spary evenly to ensure complete coverage. Do not spray into face. Spray into hand and apply to face. Use in well ventilated but not windly areas. Reapply. After 80 minutes of swimming or sweatinf. Imeediately after towel drying. At least every 2 hours. Sun Protection Measues: Spending time in the sun increases your risk of skin cancer and early skin aging. To decrease including. Limit time in the sun, especially from 10am to 2pm. Wear long-sleeve shirts, pants hats and sunglasses. Children under 6 months ask a doctor.